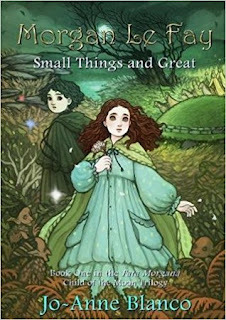 Jo-Anne Blanco, Morgan Le Fay: Small Things and Great (Book One of the Fata Morgana Child of the Moon Trilogy). Self-published, 2017. Pp. 288. ISBN 978-1-3658-2824-9. $10.94. This retelling of the Arthurian legend, the first in a trilogy, is told from the point of view of a five-year-old Morgan le Fay—a young girl coming to terms with her powers and the confines of the world she lives in. Traditionally seen as a villain of the story, it is refreshing to read a story from her perspective: that of a powerful female in a patriarchal world. Morgan’s childhood is interrupted as she experiences visions and shortly afterwards, is tasked with saving the souls of lost children. Compelled to travel to the secret and dangerous faerie realm, Morgan encounters magical creatures for the first time. The descriptions of these encounters are very enjoyable—the faeries are at once beautiful and creepy. The book presents interesting discourse on Christianity—perhaps a bit beyond a five-year-old, but interesting nonetheless. Morgan’s voice is not entirely convincing as such a small child, but this can be presumably be explained by her unique powers and magical heritage. It can be sometimes hard to distinguish between Morgan’s visions and what is really happening in the story; however, overall the story is lyrical, compelling and immersive. An interesting new take on the myth of Morgan le Fey, fans of strong female protagonists and Arthurian legends may enjoy this self-published book. It is not a children’s book, but would be suitable for a young-adult-plus readership.